A handful of years ago, I worked for a Jewish-owned online retail company. Christmas was our busiest season, so while we would get Christmas day off, we were expected to be back at work on December 26. (Boxing Day is not a statutory holiday in Quebec.) To make up for working during the holidays, they treated us to a catered kosher feast. I had a particular weakness for these little jewels called knishes. So I set out to make my own. The internet has a wealth of potato knish recipes. (There are other filling options, but potato is classic.) They’re all slight variations on each other, because nobody really follows a recipe when making knishes. Some people make their own pastry, but a perfectly delicious shortcut is to use puff pastry. Boil and mash some russet potatoes. (I use a potato ricer to make the fluffiest mash.) Sauté some diced onions until golden brown. (Choose the amount of onions to suit your taste.) Mix the mash potatoes and onions together with an egg and season with salt and pepper. Roll out the puff pastry until about 1/8″ thick. Cut into 4 or 5″ squares. Spoon the filling into the squares and wrap the pastry tightly. Brush with an egg wash, and bake at 375°F until golden brown, about 20-30 minutes. 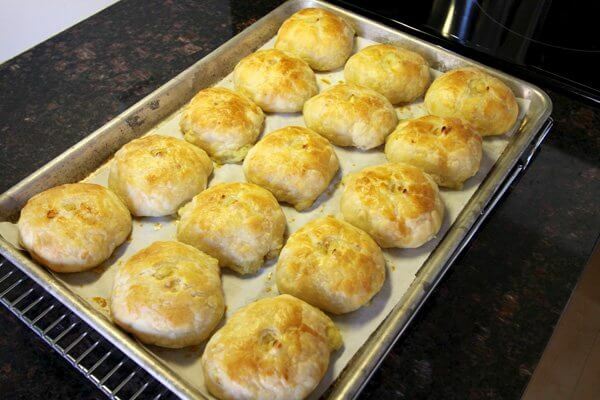 Knishes are delicious warm out of the oven, or at room temperature. But they probably won’t last until room temperature.